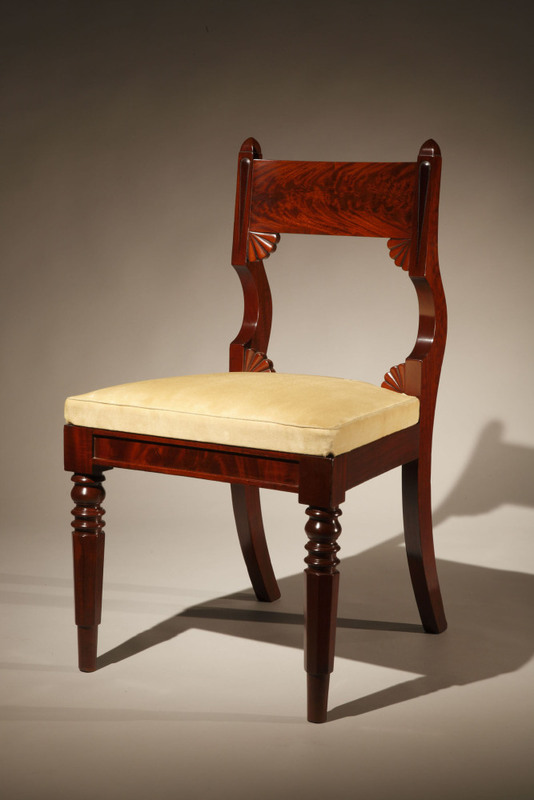 Condition: Excellent; surviving in virtually perfect condition with a few small veneer patches to the crest rails, one side chair cleaned of paint with fully restored crest rail veneer and one with a mostly re-veneered rear seat rail, the arm chair pieced at the bottom of the proper right rear leg, and one with small wood replacement to the block at the top of one proper right front leg and two with chamfered front corners, recently cleaned and re-finished with shellac, in the manner of the period. The quarter-fan and “icicle” decorative elements may have originally been ebonized. The upholstery is new. Published: Berlin, Carswell Rush, A Shadow of a Magnitude: The Furniture of Thomas Cook & Richard Parkin, Luke Beckerdite, Ed. American Furniture (Chipstone Foundation, 2013), p. 186, fig. 54. Very minor differences in the details of construction indicate that this is an assembled set although they are outwardly identical. 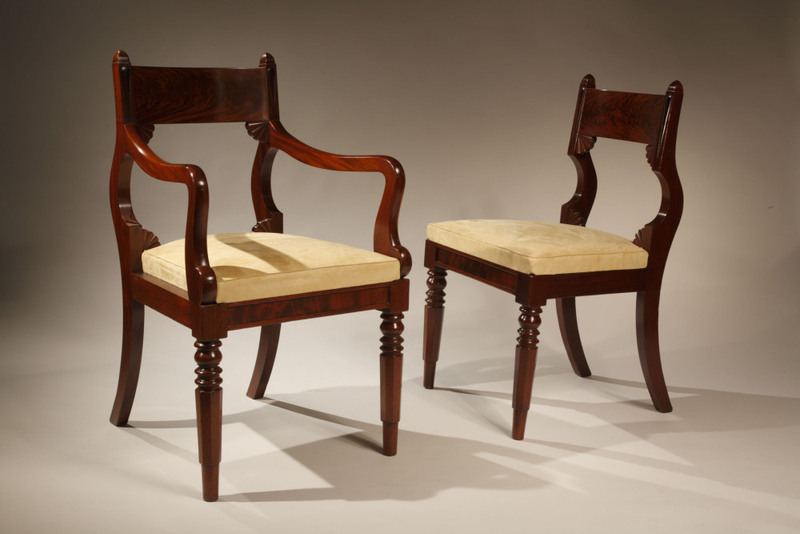 A small group of American-made chairs of this model are known including four in figured maple (with a pair of figured maple settees, en suite), one of these in the collection of The Brooklyn Museum, is attributed to French-born Philadelphia cabinetmaker Michel Bouvier (1791-1874), as is its mate at the Carnegie Museum of Art. 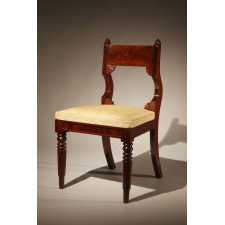 A set of eight figured maple chairs with ebonized decoration are in an important private New York City collection. 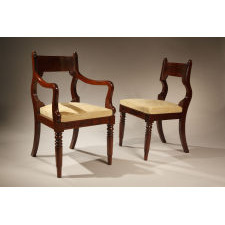 These sets have carved half-anthemia above the slip seats rather than the quarter-fan treatment used in the present set. Measurements H: 33" W: 19" D: 20"